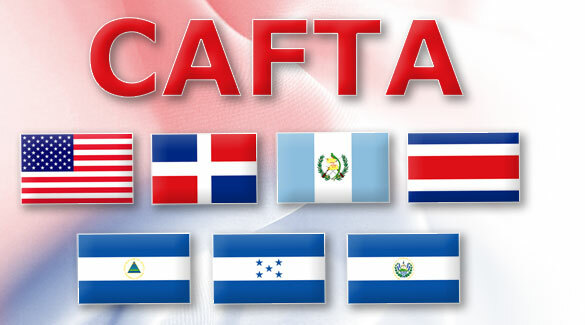 THE CENTRAL America Free Trade Agreement (CAFTA) is a treaty between the UNITED STATES and the countries of Central America (HONDURAS, GUATEMALA, EL SALVADOR, NICARAGUA and COSTA RICA)—what the Russians refer to as the “near abroad.” This is a parallel to the earlier NAFTA (North American Free Trade Agreement). The objective is a free-trade association between the countries of Central America and the United States. It is to replace the Caribbean Basin Initiative (CBI), a unilateral agreement by the United States allowing 80 percent of Central American products to enter the United States with minimal or no duty. The CBI was designed to expire in 2007. This new agreement will focus on the land-based countries and not the islands. As with NAFTA, the objective of the agreement is to create a common set of rules and standards to regulate commercial trade in both goods and services. It also has the objective of creating an economic environment that will benefit local people and thus create more stable governments. To this end, governments must privatize current government monopolies. Government-owned telecommunications were a major sticking point for Costa Rica, which at the end of 2003 asked for more time to negotiate and adjust. As of October 2003 all countries, except Costa Rica, had reached agreement. Costa Rica sought and was given an extended period for final negotiations. The United States is the main customer of Central America ($11 billion in 2002—over 43 percent of total exports from Central America). Conversely, the U.S. trade with Central America is more than its trade with INDIA and RUSSIA combined. With the implementation of CAFTA (with or without Costa Rica) this trade is likely to increase rapidly. In addition, there will be many more American companies willing to open new businesses in Central America. A hidden wild card in all this is the future status of CUBA. It is widely agreed that once the U.S. embargo on Cuba ends, Cuba will become the dominant economic power in the Caribbean Basin. NAFTA and CAFTA may provide sufficient regional cooperation to also provide competitive strength when this happens. It seems that the strategy of CAFTA is to provide a treaty distinct from anything that may occur in the islands.